EAST HANOVER — Applebee’s Neighborhood Grill + Bar, located at 240 Route 10, Hanover Commons, will be closing as of Sunday, March 24. All gift cards and coupons will be honored at other Applebee’s location. According to a source at Doherty Enterprises, no other New Jersey Applebee’s owned by their company are closing. The Parsippany Applebee’s is located at 1057 Route 46, Troy Hills Shopping Center. THE OFFICE TAVERN AND GRILL will be opening at the former East Hanover Applebee’s Neighborhood Grill + Bar. Established in 1985, Doherty Enterprises, Inc. is recognized as the 68th largest privately-held business in the New York Metro area by Crain’s Business and the 15th largest franchisee in the United States as ranked in the Restaurant Finance Monitor, operating seven restaurant concepts including: Applebee’s Neighborhood Grill & Bar, Panera Bread, Chevys Fresh Mex, Quaker Steak & Lube, Noodles & Company, and two of its own concepts, The Shannon Rose Irish Pub and Spuntino Wine Bar & Italian Tapas. In 2017, Nation’s Restaurant News ranked Doherty Enterprises as the 78th largest Foodservice revenue company in the United States. To date, Doherty Enterprises owns and operates over 150 restaurants in northern, southern and central New Jersey, on Long Island, as well as locations throughout Queens, Brooklyn, Staten Island and sections of Florida and Georgia. The Doherty vision is to be the “Best Food Service Company in the Communities We Serve” and its mission is to “Wow Every Guest Every Time, Wow Our People, Wow Our Communities and Wow Our Suppliers.” For more information on Doherty Enterprises, click here. Applebee’s Neighborhood Grill + Bar offers a lively casual dining experience combining simple, craveable American fare, classic drinks and local drafts. 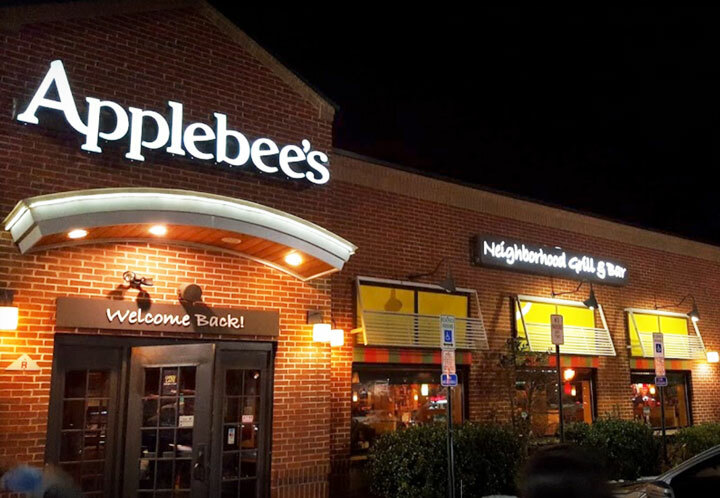 All Applebee’s restaurants are owned and operated by entrepreneurs dedicated to serving their local communities, and offering quality food and drinks with genuine, neighborly service. Applebee’s is one of the world’s largest casual dining brands; as of June 30, 2018, there were 1,883 Applebee’s franchise restaurants in all 50 states, Puerto Rico, Guam and 13 other countries. Applebee’s is franchised by subsidiaries of Dine Brands Global Inc. [NYSE: DIN], which is one of the world’s largest full-service restaurant companies.